I am going to attempt a couple of mini tutorials. The first will be for a mitered square from striped fabric and the second will be a very mini tutorial on the quilted patchwork purse. 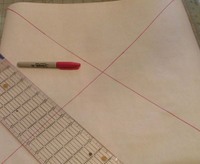 Draw intersecting lines from each corner and cut along these lines to make four triangles. 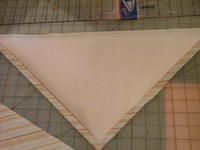 Cut the triangles 1/2 inch wider on each side for seam allowance. Sorry about the change in fabric. I experimented with two different prints for this tut. 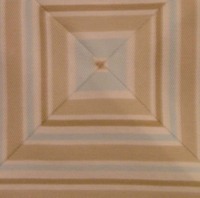 Match up the triangles along one short side, making sure your stripes are matching. Pin heavily. I also used my walking foot to avoid any shifting. If you don't have a walking foot heavy pinning should work. Sew down one short side. Repeat with the other pair of triangles. Iron the seam open and it should look something like the picture above, a bigger triangle. 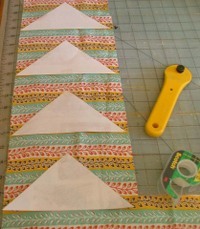 Place the large triangles together along the long side, matching the stripes and again pinning heavily. Sew along this line. When you're finished it may look something like this. I bet you're saying " I hope not." I agree. It looks kinda wonky there in the middle. I don't think this fabric is the best choice for this technique. This helps. Oh, this one is miniature. I only had a little of this fabric so it will probably become a pin cushion. This one is bigger and I'm happier with the look of it. It will be an 18" pillow cover when it is finished. 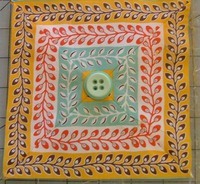 Several people have asked about how to make the quilted patchwork purse. I found the pattern for this purse in a Japanese craft book called Machine Made Patchworks. Since I can't read Japanese I don't know if I am following the pattern correctly or not, but here is how I construct the outer purse pieces. Each side of the purse is made up of 8 strips that are a wedge shape. 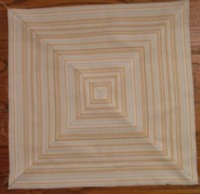 Each strip is 11" long by 3" wide at the bottom and tapering to 2" at the top. You can use any combination of fabric you choose. 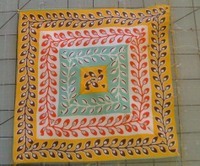 I've seen it done with two different fabrics or you can use 8 different prints. 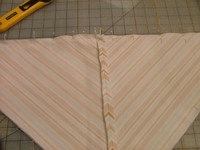 After you have cut your strips lay them out in a pattern that is pleasing to you. 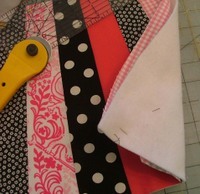 Once you are happy with your layout, sew the strips together. I use a 1/4" seam allowance. Here they are sewn together. Use this as a template to cut your lining pieces, your batting and interfacing for the lining. I use pellon craft fuse to interface the lining pieces and I have used quilt batting or a heavy fusible fleece for quilting the patchwork pieces. For this one I used fusible fleece. I fused the fleece to the back then machine quilted. I quilt straight lines from top to bottom starting about 1/2 inch apart widening as you go to the bottom to follow the shape of the strips. From this point I assemble it like this, except for the square bottom.